The Walt Disney Animation Studios has released the first teaser trailer for their upcoming animated adventure film Moana. And it looks nothing short of fantastic. The animation looks crisp and flawless. Maui, the protagonist in the film, looks intimidating and adorable at the same time. The white pig is cute as hell. The princess, voiced by newcomer Auli'i Cravalho, would make your heart melt. And last but not the least, the music sounds amazing. A quick look into the movie's Wikipedia page divulges that the artists behind the film's soundtrack are Lin-Manuel Miranda, Opetaia Foa'i, and Mark Mancina, three respected musicians. The first teaser trailer released on June 12, 2016 by the Walt Disney Animation Studios is just a teaser trailer which means the full and complete trailer is still in the works. The movie is scheduled to be released in November 23 so the full trailer should be coming along soon. The tease trailer is simply amazing. The art and illustrations in the first few seconds of the clip are unique and very well-made. They remind me of the beautiful art sequences during the start and end of the 2014 film Hercules (also starring Dwayne Johnson). 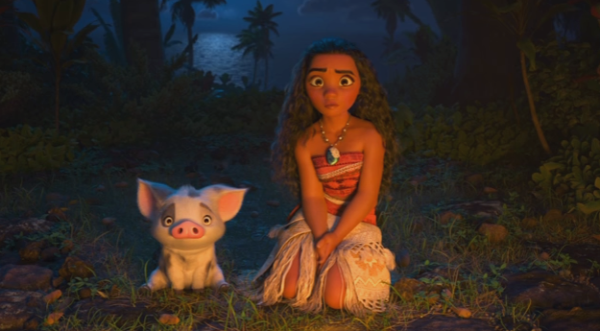 The trailer introduces us to three main characters from the animated film: Maui (voiced by Dwayne Johnson, Princess Moana Waialiki (voiced by Auli'i Cravalho), and a white pig. Props to everyone who rendered and designed the characters because they all look great. The theme of the movie is inspired by the story of Maui who is a culture hero and an ancient chief in Hawaiian mythology. Maui is a demi-god who is so powerful he can haul up islands from the bottom of the sea using his fish-hook. He can also restrain the sun and stop it from moving too fast. He can even lift the sky. However, the main character in the movie is the young princess Moana. Born from a family of sea navigators, the young princess sets out on a journey to search for a legendary island. Along the way, she meets and teams up with the demi-god Maui whom she considers as a personal hero. Is Moana Going To Be Hit? The movie has all the ingredients to become a box office hit. First of all, it's directed by the duo of Ron Clements and John Musker, the team behind Disney hits like The Little Mermaid, Aladdin, Hercules, Treasure Planet, and The Princess and the Frog. If the movie contains scenes that are similar to those shown in the teaser trailer, then audiences are in for a real treat. And of course, let's not forget the fact that one of the main characters is voiced by Dwayne Johnson who is one of the most bankable actors alive.